Since the first appearance of the miraculous image in Genazzano in 1467 until this hour, no publicity campaign has been made to influence the multitudes who come to venerate Our Lady there. The pilgrims come and they go. 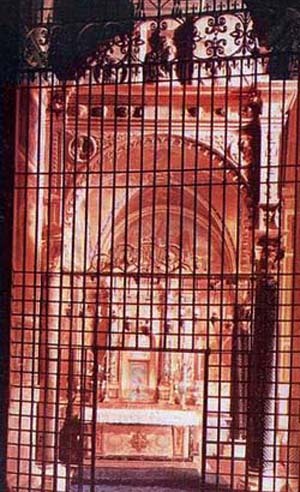 They kneel for hours before her Shrine, often even when the sacred Image is far from their eyes behind the locked grille. Who they are, why they come, no one inquires. There is no registry to sign. At their departure, however, they often find their hearts are eased and grateful. This one has an unexpected resolution to a difficult problem; another is relieved of some sickness or disease, yet another resolves to turn away from the path of sin and begins to live a good Catholic life. The remedies and counsels Our Lady gives at Genezzano are countless. In the mid 18th century, the sacred image unexpectedly came to the knowledge of Andrew Bacci, a Canon of the Basilica of St. Mark in Rome. In the year 1734, Canon Bacci found himself extremely agitated internally by circumstances that disturbed his mind and soul night and day. It seemed there was no resolution to the problem he described later as “fatal,” and he was in a state of near despair. On December 7 of that year, he went to visit a young lady who had such painful nerve contractions that she had not been able to stand on her feet for eight years. He found her completely cured and free of pain. Struck with astonishment, he asked her how this had happened. She told him that only a few days prior to his visit, she had been taken to Genezzano – about 35 miles southeast of Rome – so that she might ask Our Lady of Good Counsel for the grace of a cure. Praying before the image at the foot of the lateral altar, she suddenly felt the nerves of her feet loosen themselves and become vigorous. For the first time in years, she stood, without any pain. Casting aside her crutches she began to walk. Then, after rendering her most heartfelt thanks to Our Lady, she had returned to Rome completely cured. Hearing this account, Canon Bacci felt a deep desire to visit the same Sanctuary. 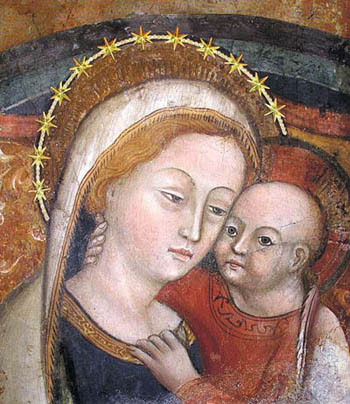 He had an inner certitude that there, before the miraculous fresco of the benignant Mother of Good Counsel, he would find a remedy for the problem that destroyed his internal peace. That very evening, the vigil of the Immaculate Conception, he took a carriage and set out alone for Genazzano. About 12 miles from Rome, he heard the coachman scolding a poor boy who was trying to sit at the back of the vehicle, telling him to get off. The poor child, around 10 or 11 years of age and shivering with cold, replied that he had sore feet, and asked in the name of charity to be allowed to remain. Hearing the child’s sweet plaintive voice, Canon Bacci dismounted and saw the poor boy had been thrown to the ground. Moved with pity, he tenderly lifted the child up and placed him at his side in the carriage, covering him as best he could with wrappers. He took the boy to dine with him at his table and paid a room for him at the inn where he stayed. The next morning, they recited the rosary together in the carriage as the trip commenced. Before beginning, the boy addressed him with a strangely imperious tone of voice, saying that he should say it every day. After the rosary was over, the child told him, “For the great charity that you have shown me, you will have the grace that you are going to ask from the Virgin Mary." 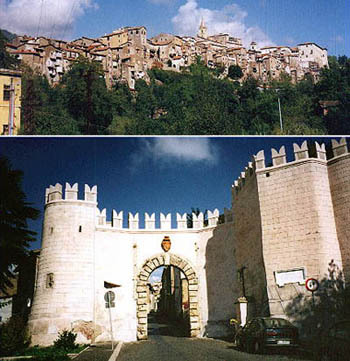 When they reached the crossroad dividing the lane into two branches, one leading to Genazzano and the other south to Paliano, the Canon bade farewell to the boy, giving him as many extra pence as he had to help him on his journey which took him on the other road. The carriage had proceeded onward but a few paces when Canon Bacci realized he had forgotten to invite the boy to go with him to Genazzano. He ordered the coachman to turn back, but they could not find the child, who seemed to have vanished into the air. Astonished, he continued on his way and soon found himself at Genazzano where he was kindly received by the Augustinian friars at the Church. There, before the Sacred Image, he asked Our Lady to give him the good counsel and great grace that he sought. As he prayed along with the Litany that was being recited, he saw the face of the Image changing the expression and reddening like a crimson rose. When he commented on this later to one of the Augustinians, the priest told him that this was a good sign that Our Lady was giving him a favor, because often her countenance changes to show the person the grace she wants to give. To this very day, in fact, pilgrims report that at times Our Lady's face changes expression, a sign of a grace she is disposed to give. On his return to Rome all sorrow and anxiousness disappeared. He was filled with a peace, calm and quiet of mind that he had not dreamed possible the day before. 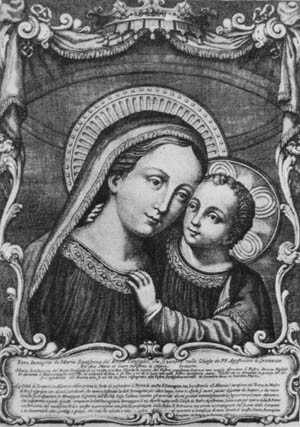 In his gratitude to Our Lady of Good Counsel, he resolved then to promote her veneration whenever and however he could. Telling others of his own experience, he encouraged all – especially troubled and afflicted persons – to have recourse to her in Genezzano. He also began to distribute pictures of her, recommending to those who received them that they should honor her and pray to her, making the firm resolve never more to offend the Divine Majesty for the love of Mary. In a letter dated February 2, 1748, he wrote that he had given away over 90,000 pictures of Mother of Good Counsel. He spread them throughout the Papal States, and Rome, then in Florence, Genoa, Venice, Lombardy and Istria in Dalmatia. As reports circulated of the many miracles worked and graces	given through the intercession of Our Lady of Good Counsel, requests for pictures came from Portugal, Catalonia, Brazil and other places in Africa and America through various apostolic missionaries. His zeal animated the custodians themselves of the Sacred Image with fresh ardor. Through his advice, a new registry of miracles was opened by the Augustinian Fathers in 1748. Through him, a beautiful proper office was composed for the feast of the Wonderful Apparition and was recited in Genazzano, the Diocese of Palestrina and in the whole Augustinian Order until it was rewritten after Vatican II. 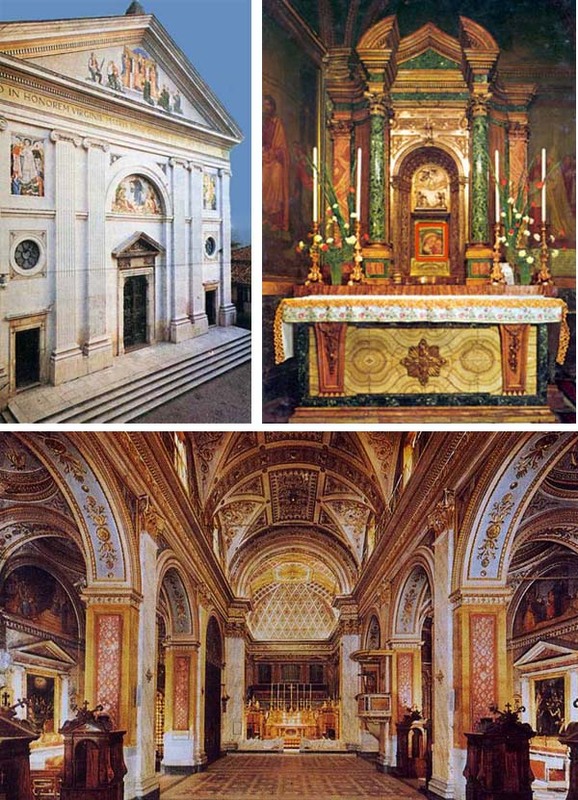 He obtained from Pope Benedict XIV the privilege to establish the Pious Sodalicium of Our Lady of Genazzano in the Church of San Pantaleo ai Monti in Rome. He further caused Fr. de Orgio to write a history of the Translation and the Apparition of the Image of Our Lady of Genazzano, which helped to spread the devotion. Towards the close of his days he retired to Genazzano, so that he might be as near as possible to his beloved Virgin Mother. Finally, he took up his residence at a monastery close to that wonderful Image of Mary. It was there that he died on the feast of the Transfiguration of Our Lord in August 1758. His body is buried in the Church of Santa Maria, a short distance from the railing of the Sanctuary of his beloved Our Lady of Genazzano. 1. George F. Dillon, The Virgin Mother of Good Counsel, Rome: Office of the Sacred Congregation, 1884, Letter, pp. 386-397.